Efficiency refers to a filters ability to trap wear-causing contaminants and prevent them from circulating throughout the engine. Ea Heavy-Duty Extended-Life Oil Filters are engineered using full-synthetic media that provides an average filtering efficiency of 98.7 percent at 20 microns in accordance with industry standard ISO 4548-12, ranking them among the most efficient available for heavy-duty applications. Increased efficiency helps reduce wear for long engine life. 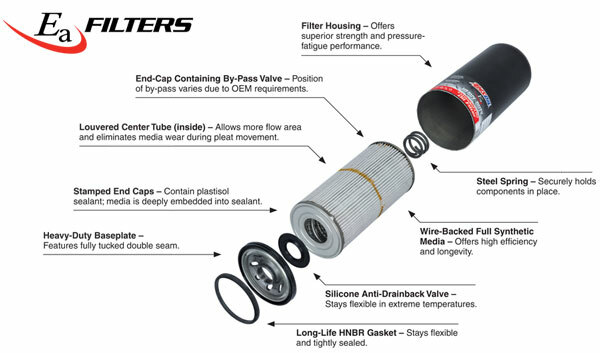 A filters capacity refers to the amount of contaminants it can hold and still remain operational. AMSOIL Ea Heavy-Duty Oil Filters have a high holding capacity for small, wear-causing contaminants. EaHD Heavy-Duty Oil Filters are made with premium-grade full-synthetic media. The strictly controlled processing of this media ensures accurate filter construction. Ea Heavy-Duty Oil Filters are recommended for heavy-duty on- and off-road gasoline and diesel applications including, but not limited to, over-the-road trucks; dump trucks; refuse haulers; school buses; farm tractors; mining, construction and industrial equipment; and more. Popular manufacturers include Caterpillar, Peterbilt, Mack, Kenworth, John Deere, Ford and several others. Consult the Heavy Duty Filter Lookup for specific product recommendations.